Paellero burner: Inner ring 10 in. (25 cm). Middle ring 15 in. (38 cm) Outer ring 24 in. (60 cm) in diameter. 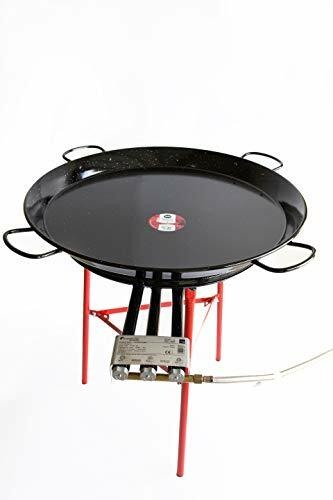 High range for paellas from 12 to 35 in. (30 to 90 cm). Power 11.4 kw. Support feet, adjustable in height. Ideal for leveling. Height 27.55 in. (70 cm). Paella Valenciana Polished/Enamelled of 32 in. (80 cm). 8.8 lbs (4 kg) of rice serves 40 tasting portions (30 - 35 people). These paelleros are more robust and wider than the traditionals paelleros. Total flame control at maximum and minimum. These gas burners are shaped to where the flames exit laterally allowing you to cook larger paelleras evenly. Authentic and traditional. Exclusive manufacturing process that evenly distributes the steel throughout the vessel. Durable riveted handles for durability. They deform less than other brands. Exclusive chopped base holding the original shape. Easy to clean Models respectful of the original tradition. You'll make a paella just like before. If you have any questions about this product by Vaello by Castevia Imports, contact us by completing and submitting the form below. If you are looking for a specif part number, please include it with your message.